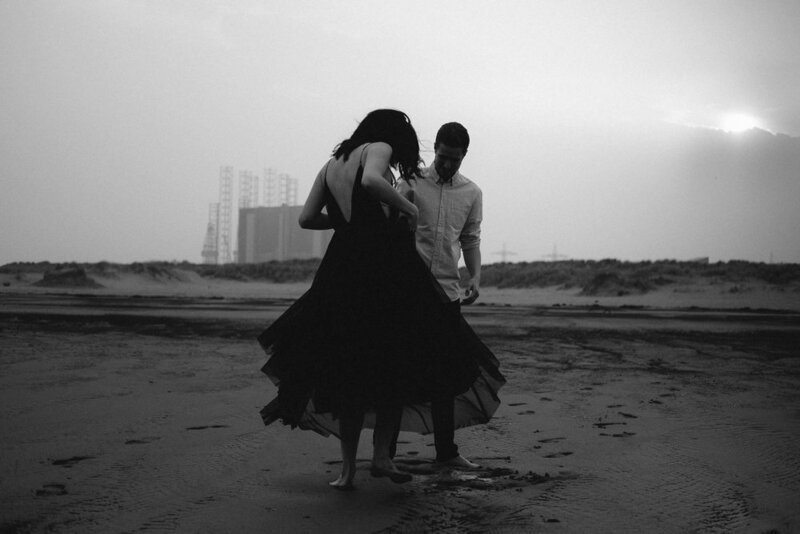 This pre-wedding session with Regan and Conor at North Gare Beach in Seaton Carew didn't start well. I'd been looking to push myself creatively and work with more adventurous couples, and one idea I had was to take engagement photographs of a couple in the sea. 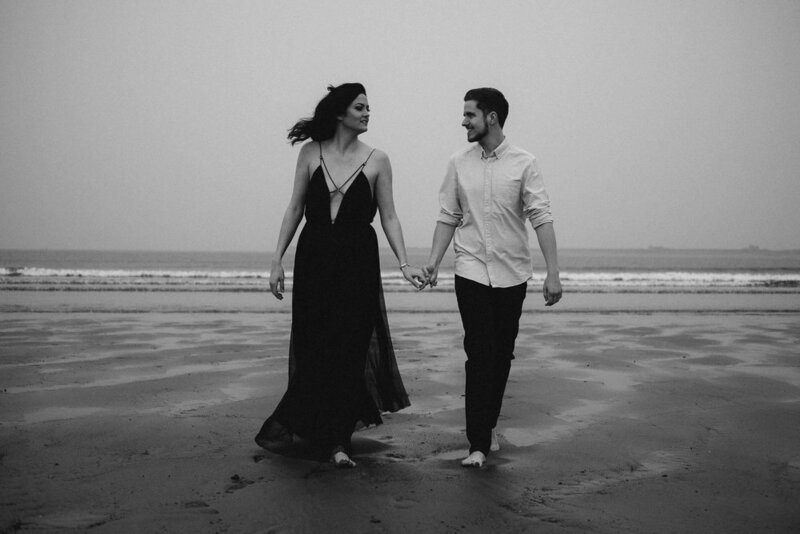 Regan and Conor were crazy enough to say yes, so we arranged to meet at the Blue Lagoon, which forms part of the Teesmouth National Nature Reserve. The beach forms the northern shore of the mouth of the River Tees as runs into the North Sea. The backdrop is a strange combination of natural beauty and heavy industry. The view southwards is towards a multitude of chimneys and cranes, whilst behind the south end of the beach is the power station. The location didn't bother me; it excited me. I'd been introduced to this part of the world by Rachel & Chris when I photographed their Industrial pre-wedding session at South Gare. It was the good old British weather that had me concerned. It's one thing stripping off and frolicking in the Mediterranean while the sun beats down on your back, but it's quite another to run into the freezing North Sea on a foggy and drizzly spring day. I had thought Regan and Conor would make some excuses but they were still keen to give it a shot. Get in! I of course had to take off my socks and shoes and get in the water myself, and I can testify that it was bloody freezing! To add to the mood even further I popped off a smoke bomb just as my engaged couple entered the water. The wind blew in the right direction and I ended up with some of my favourite photographs I have ever taken. Instead of fighting the light and weather conditions I went with it when editing the photographs. I converted almost everything to black and white. I added heavy grain. I included the steel refineries, power stations and cranes in the background (which many people told me to edit out). I know that these photographs will put off many couples who are looking to hire me for their wedding or couples session. And that's okay with me. They are marmite images. Some people love them and some people hate them. They definitely won't appeal to 'Barbie' brides. If that's you, you aren't my ideal bride anyway, and there are many photographers out there whose work you will prefer. 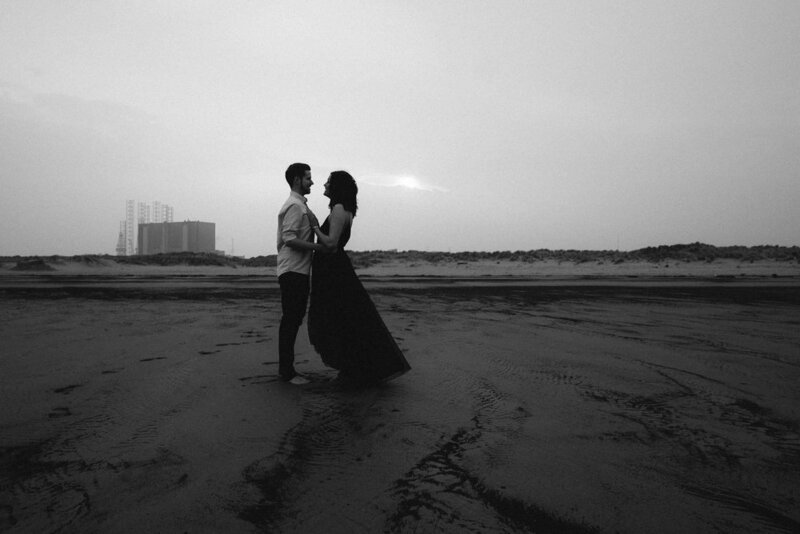 My couples love black and white photography. They aren't afraid of getting wet hair or a muddy dress. They don't need a million lovey-dovey photographs of them smiling at the camera. They want their photographs raw, real and authentic. Well, what do you think? Love them or hate them? Let me know in the comments below. And if you think you might be one of my couples contact me here. You can see more of my work in the Durham area on my Durham weddings page.